Part book club and part science café, Pushing the Limits is an exploration of how the science of the real world around you matches up with the written word. Once a month, you can join us to discuss one of four carefully selected books and learn about the hidden roles science plays within your everyday life. Spencer Public Library is partnering with local high school science teacher David Munson to bring this fantastic new program to you. Sign up today and check out a copy of our first book, When the Killing’s Done by T.C. 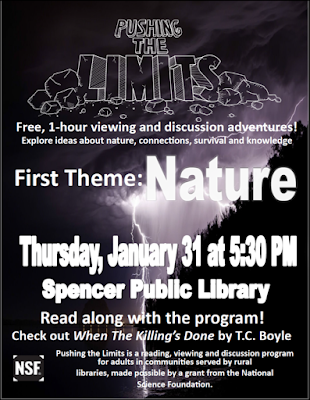 Boyle, and then stop in for a chance to win some door prizes and enjoy a free meal when we meet to discuss the book on January 31st.